Orpha Louise Montgomery obituary. Carnes Funeral Home. 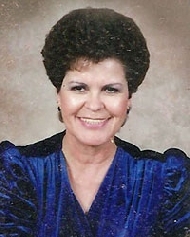 Orpha Louise Barnard Racz Montgomery, 74, of Vidor, TX for 22 years, passed away on July 11, 2015. Her battle with Stage 4 Lung Cancer placed her in the loving hands of Jesus. Orpha Louise Barnard Racz Montgomery was born on March 20, 1941 in Warren, OH to parents Wilson Dorff Barnard and Violet Catherine Noble. Orpha is survived by her husband Howard John Montgomery and five children, Cary L Lavisoa (Victor), Chris L. Racz, Colleen L. Porter (David), and Craig L. Racz (Christina); Grandchildren Alexis F. Montgomery, Dannie Racz, Chris Racz, Jacob Racz, Jordon Porter, Raymond England, Kiara England, and Sierra England; Brother Dr. Roger Barnard (Deloris Ludwig). Orpha graduated high school from Champion High School in Warren, OH. She completed her two year Associate's Degree at Kent State University and completed her Nurse's Aid certification in San Diego, CA. Orpha worked in the medical field as a nurse's aid in Beaumont, TX at Beaumont Pediatric Center as a Shot Nurse until she retired in 2003. Orpha belonged to the VFW 8246 in Vidor, TX, and was apart of the Lady's Charter as their Treasurer. Memorial Services will incur at the Vidor VFW 8246, 2110 N. Main, on July 19, 2015, at 1:00 pm. "Say not in grief 'he is no more' but lived in thankfulness that he was".